Karl Fritsch, April 2012. Photo: Justine Olsen, Te Papa. 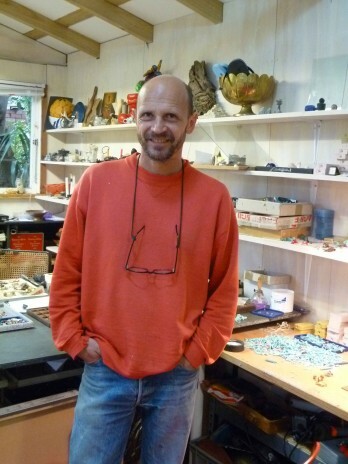 German jeweller Karl Fritsch, whose jewellery and objects are on display in Collecting Contemporary now lives in Wellington. The building of this workshop has been a key ingredient in the development of some of his work in the show. Ring, below, was made in 2010 soon after settling into Wellington and about the time that the construction of his studio occurred. You can see the associations: working from a cast silver shank and building the decoration using nails, screws and bolts. Through viewing his work in the exhibition, you can see that materials are his starting point in the making process. Silver, gold, bronze and now ceramics are amongst some of those materials that are cleverly worked, achieving delightful and original outcomes. It’s a highly intuitive process that can include casting, reshaping of found objects and manipulation of materials resulting in the questioning of conventional thinking in jewellery. I wanted to enlarge my understanding of Karl’s practice so last week I visited his studio. 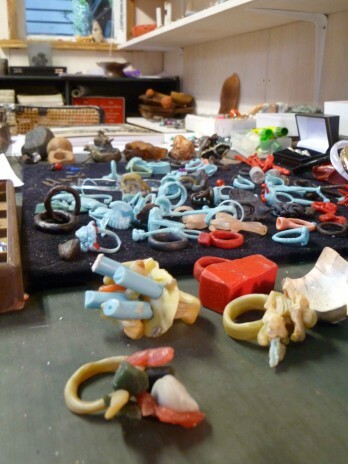 When you step through the door, objects and materials reveal many stages of making jewellery and objects. For Karl, casting can be the first stage in the construction: it’s known as the lost wax process. This traditional method allows for highly accurate reproduction from the original wax form. You can see this stage in this photo below. Different coloured waxes allow soft or hard modelling to occur. Inside Karl Fritsch's workshop, April 2012. Photo: Justine Olsen, Te Papa. In this image you can see the way Karl considers his ideas. The blue and yellow wax modelled ring, in the foreground is particularly interesting. Karl shapes the claws in a similar way to the sprus, (used during the casting method to provide a means for the casting molten material to flow away from the model and air to escape). Traditionally, sprus are removed but Karl has added this highly functional device into a new form of decoration: it’s a way of turning the making process that traditionally is hidden on its head. You can see this idea used again by Karl in Gingerbronze , below, from the installation Gesamtkunsthandwerk when Karl collaborated with Francis Upritchard and Matino Gamper. The work can be seen in Collecting Contemporary. 'Gingerbronze. From Gesamtkunsthandwerk'. 2011, New Zealand. Gamper, Martino, Upritchard, Francis, Fritsch, Karl. Purchased 2011, Te Papa. 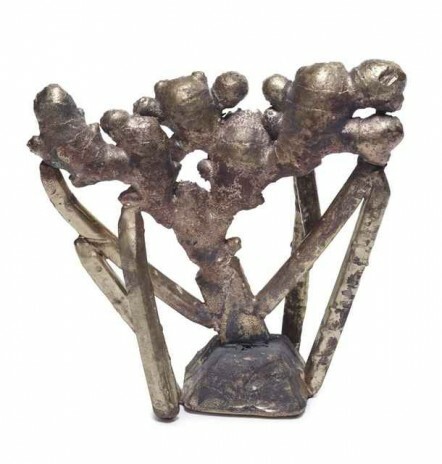 For more information on the lost wax casting method, visit this website that shows larger sculpture created through this process. For more visits to jeweller’s workshops, check out Collecting Contemporary and the artists interviews.